Q: How many Marxists does it take to change a lightbulb? A: You can’t change the lightbulb, you’ve got to change the system. My other favourite is the one about the Trot caught bashing up his bog. “I said smash the system”. The Financial Times has just run its second series on capitalism in three years. In 2009 it analysed “the future of capitalism“. The future turned out bleak: it’s just proclaimed that capitalism is in crisis. The FT’s chief economics writer Martin Wolf hails from a very different corner of politics to Callinicos and Eagleton, so it’s entertaining to read his remedies. First, he recommends managing instability. He agrees with leftists that capitalism is inherently wobbly. The mainstream of economics had come to believe that it could tame the tiger through a competitive economy and a trustworthy central bank which convinced everyone that inflation was under control. That view turned out to be wrong, and like most economists nowadays Wolf is a late convert to Hyman Minsky, who decades ago foresaw that the very upturn which appeared to be creating newfound prosperity would itself create unsustainable levels of debt, in turn bringing the whole edifice crashing down. Wolf thinks that regulation, better government supervision and enhanced central banking can stop similar crises from happening again. I’m not so sure about the latter, given the almost unanimous deification of central bankers and their cohort in the last decade or so, and their abject failure. 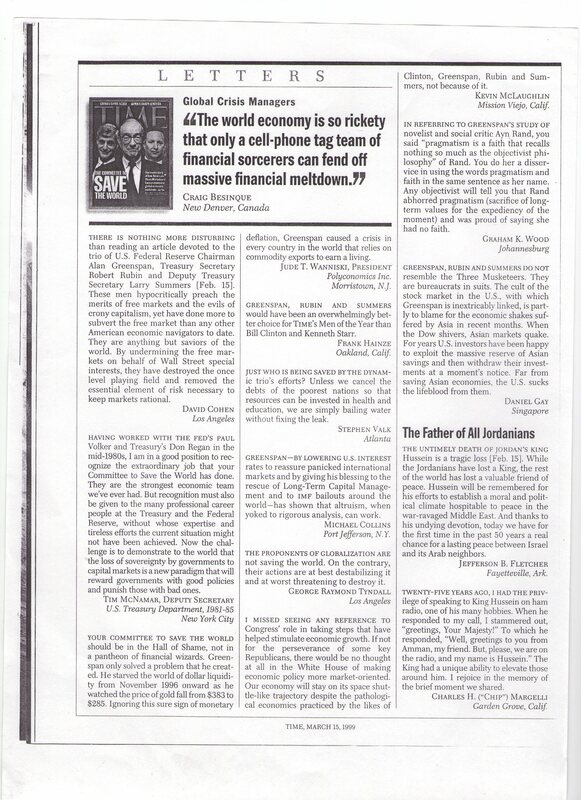 As I wrote to Time magazine 13 years ago, Greenspan and his friends at the US Treasury weren’t the “Three Musketeers”; they were men in suits, and they’d turned the stock market into a cult. “Protecting the economy from finance” is strong stuff, given that a few years ago politicians and economists couldn’t wait to bow before the Goldman dollar. But shielding poor old corporate capitalism is what Wolf thinks we should do. He thinks the main banks shouldn’t be allowed leverage of more than 10 to one. Investment banking must be separated from ordinary deposit-taking and lending. People need protection from predatory mortgage sellers. I was struck by the way in which US capitalism unwound because it had preyed on the poor. Parts of Wall Street purposefully sought out vulnerable borrowers so that they could foreclose on their properties when they failed to keep up repayments. Wolf also advocates redistribution. This is something that probably only plays to a UK rather than an American audience, but it’s vital. Propping up the poor is not only moral; it’s essential to sustaining demand during crises. Inequality is also bad for the rich in the form of increased insecurity and a fractured society. Making sure that rich people pay their taxes would go a long way, but as Wolf acknowledges, closing international loopholes is a tricky task, and one that requires international cooperation. Wolf’s probably a bit more of a fan of the corporation than I am, but he points out that it’s central to capitalism’s success. He thinks that it’d be tricky to hold companies to account, given that it’s the freedom of their environment that’s partly the source of their dynamism. But he does recommend making pay structures transparent and he believes that boards should be diverse and well-informed. I suspect this sort of talk would invoke snorts of derision from the likes of Eagleton. For Marx, companies were both the origin of dynamism and the locus of exploitation. Hoping that they will somehow mend their ways is akin to wishing that X-Factor would become a bit more intellectual. Probably the best insight is that: “Protecting democratic politics from plutocracy is among the biggest challenge to the health of democracies.” One of the reasons the bankers were so readily bailed out is that they bought the West’s politicians; probably more so in the States than here. Wolf is right that parties should be funded publicly. I’d say that private contributions should be severely limited if not curtailed. Lastly, Wolf says that “open markets, monetary and financial stability, security and, above all, protection of the environment” are all global public goods and that they need to be regulated internationally — something that’ll be very unlikely in the near future. He still thinks we should strive to make capitalism better rather than accepting it for what it is. Despite their differences, ironically much of Wolf’s analysis could have come from Marx: the acknowledgement of instability; the globalisation of capital; the injustice of inequality and the influence of business on government. Maybe Wolf isn’t so far removed from Callinicos and Eagleton after all. Yet despite admiring the unfashionable consistency of Marxists, I find Wolf more interesting. Yes, Marxists aren’t afraid of using the c-word and they know the next calamity is around the corner. But their obsession with the system means they don’t always bother with nuanced policy prescriptions. Persistent bearishness is a bore, and it’s too easy. It’s helpful to think of capitalism as a stage in history and as something separate from the actual everyday workings of society because we can then think of radical ways of fixing or superseding it. But we don’t live in a world that is functionally destined to fall about our ears with predictable regularity. Crises do catch us unawares, and they happen in slightly different forms. John Maynard Keynes taught us (or should have, until most economists forgot him) that things can be done to regain full employment. Sometimes it’s good not to be shackled to ideas about the system.